I also have it in Tibetan (a pdf copy from Ken McLeod's book) and would very much like to learn pronouncing it in Tibetan (without starting to learn Tibetan). I'd be grateful if anyone could help me out with producing an audio recording. Volunteer please contact me. 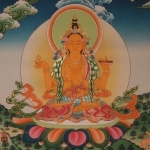 If anyone can provide the name of the Tibetan text, that would be helpful. This is how the text starts. Hope that helps. There's another translation in Van Schaik's "Approaching The Great Perfection", as well as the Wylie. you can get an approximate phonetic rendering of the Tibetan from the Wylie. I bow to the aware Ever-present Good. using the default settings. Keep in mind that the phonetics may not really be all that accurate and there are various dialects that can sound quite different. Anyway, you can at least get a feeling for the pronunciation this way. Thanks a lot dzogchungpa, I'll start from there.